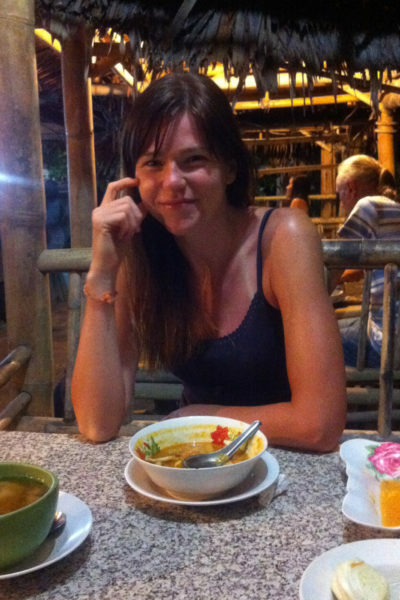 This is a recipe for a vegan homemade curry paste that uses 100% natural ingredients, takes only 15 minutes to make and tastes very authentic to the red curry dishes we so enjoyed during our travels in Thailand. Why exactly would you want to make your own curry paste instead of buying one from the store? There are several great reasons for investing your time and energy into making your own curry paste. For one like most homemade recipes, it’s far fresher than anything store-bought. Secondly, you have full control of the ingredients so you don’t have to compromise your whole food plant-based diet. Did you know that most store-bought versions of curry paste actually contain fish sauce? And if you ever tried to find a vegan kind, you know it can be difficult.Plus in a matter of 15 minutes, you can make a batch that will last you for months without the unnecessary preservatives and refined sugars! This curry paste creates a great base for quite a few dishes. For example, you can take any leftover vegetables, simply add 1-2 Tbsp of this vegan red curry paste, mix in some coconut milk and in a matter of minutes, you will have a delicious curry on the table to enjoy. Or you can make a comforting soup similar to this one, perfect for a busy weekday dinner. 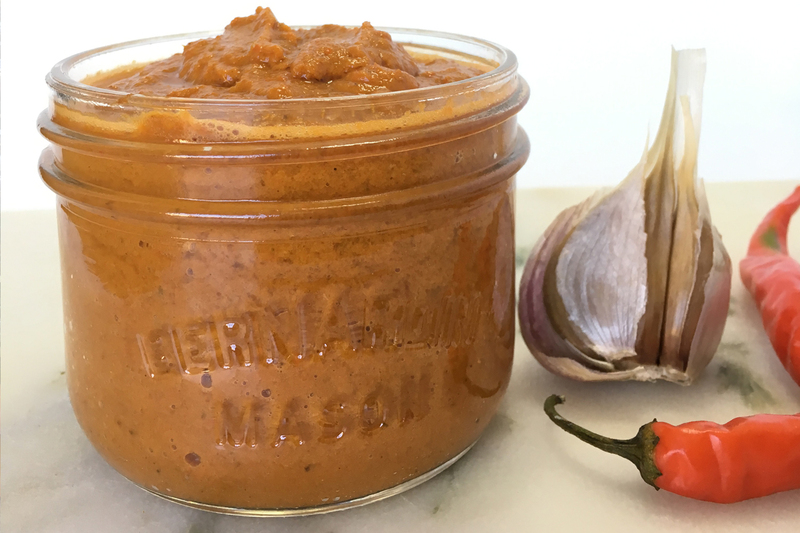 Here is one of our favourite recipes for using this red curry paste. 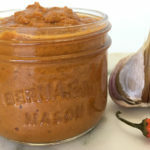 Thai red curry paste is super easy to make, versatile and super delicious. Red pepper, sundried tomatoes and shallots make this recipe extra delicious. Loaded with turmeric, ginger, lime juice+ zest, and lemongrass, this paste tastes pretty authentic and you can freeze it in smaller portions then thaw and enjoy for a ridiculously quick mid-week meal. Place all ingredients in a food processor or blender and process well to create a fragrant Thai red curry paste. If too thick, add a little more coconut milk to help blend ingredients. Keep in mind that the paste will taste very strong, but will mellow when you add all the other curry ingredients (vegetables, chickpeas, coconut milk, etc). The recipe is completely customizable depending on the desired heat level. Our variation can be considered about a “medium” heat level. For “mild” omit the red chillies, and for “hot” use 3 red chillies and add 1/2 teaspoon ground cayenne pepper (or to taste). This recipe makes about 12 ounces (around a cup and a half) of curry paste, so you can keep some in your fridge (it will last about a month) and freeze the leftovers. 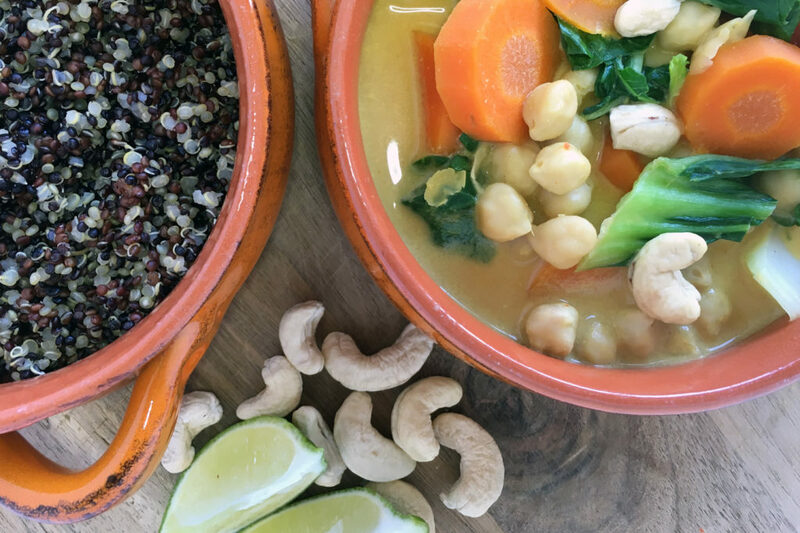 If you want more healthy Thai recipes that are quick and nutritious you might also enjoy Raw Vegan Pad Thai, Thai Curry Sweet Potato Soup or Vegan Thai Curry In a Hurry. What are the ingredients? I don’t see them listed. Love me some curry and want to make this. Hello Susan, strange? We will look into this ASAP! Thanks for letting us know. All the ingredients are there now 🙂 Enjoy the curry!